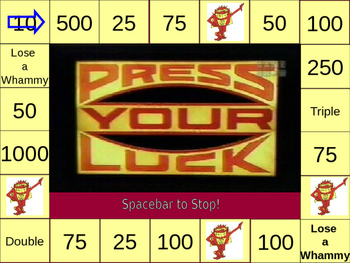 Powerpoint Game "Press Your Luck"
Tired of Jeopardy? This is a fun, interactive PowerPoint game that can be used for any subject and any grade. Simply add your 16 questions and answers into the slide and play. To get the arrow to stop, press the spacebar. 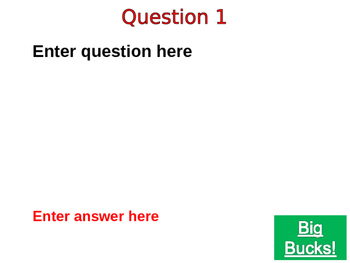 Click on a question hyperlink, click again to reveal answer, and then click on "Big Bucks" green hyperlink on bottom right-hand corner to go back to the board. You can play as one big team against another class, or you can divide the class into 2 or 4 teams. 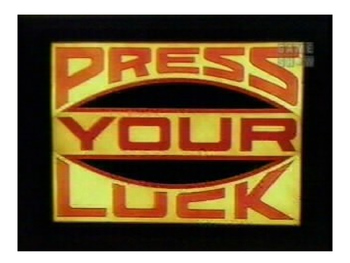 You can determine the consequences of a whammy. I deduct 100 points for each whammy.